Don’t you just love the holidays?! So many wonderful things to enjoy! 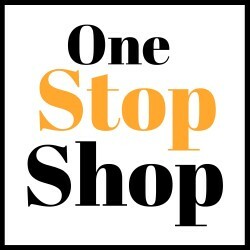 Family and friends landing on your door step to enjoy wonderful food and times with you. Having to feed a crowd can be very labor intensive especially for dessert but we have that covered for you with this easy Pumpkin Slab Pie. 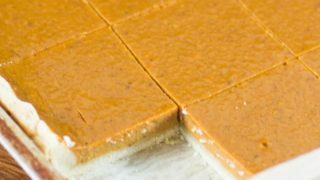 This Pumpkin Slab Pie is one of the best Thanksgiving desserts around. Everyone craves pumpkin at this time of year. It is pure comfort food! Instead of baking up many pies you can have this dessert served at the table much easier. Plus what I like the most is you can have a little square and still feel very satisfied. After a big turkey dinner it is hard to resist the dessert but I usually don’t want a big slice of pie either. These squares are just perfect. 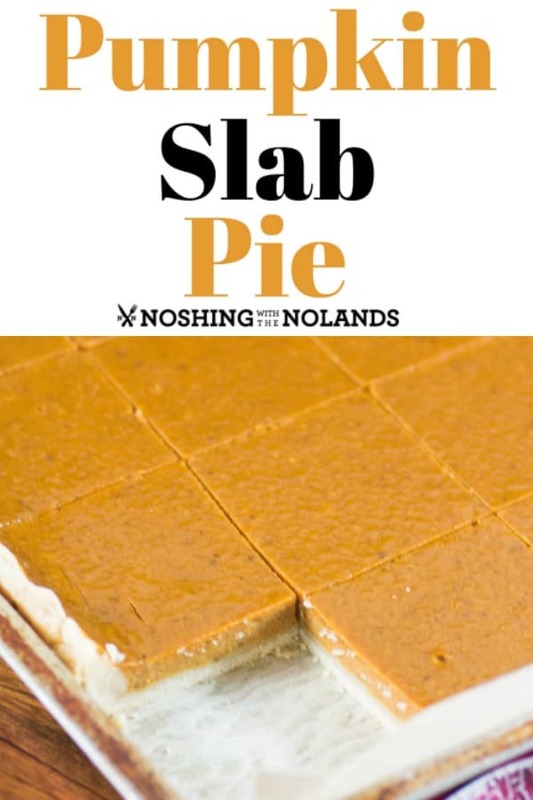 What is a Slab Pie? A slab pie is simply a pie made in a jelly roll pan. All you need is a jelly roll pan with 1″ sides that is not too big. A jelly roll pan is also called a rimmed baking sheet. Mine is just under the recommended size of 11×17″ like by a 1/2″ in length. So I am going to use the standard jelly roll pan for you all. Now doesn’t that look amazing?! And like I said the perfect amount for me! You can always have seconds if you want more! 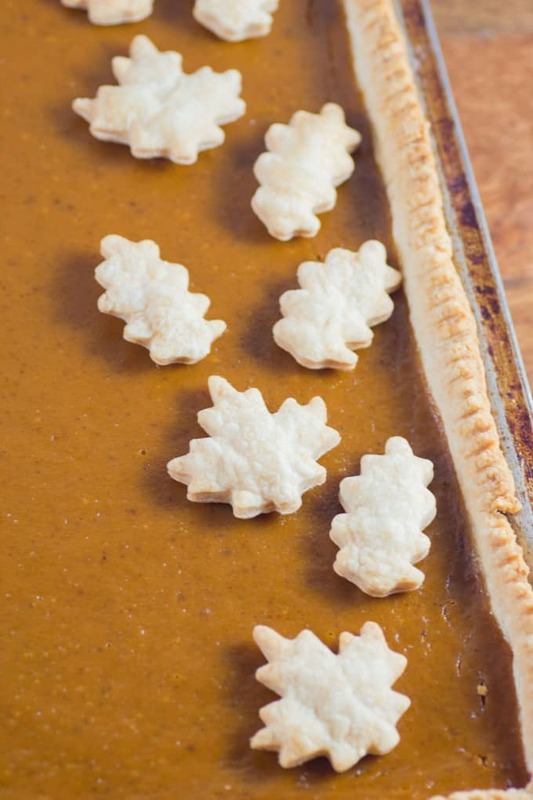 Having a little fun with the pie dough, Ken made up these little maple leaves for decoration on the pie. When serving each slice can get a dollop of whipped cream and a leaf. You can cut out oak leaves if you like. We just got a print out off the computer and Ken cut around it to make the little leaves. A cookie cutter would also work. 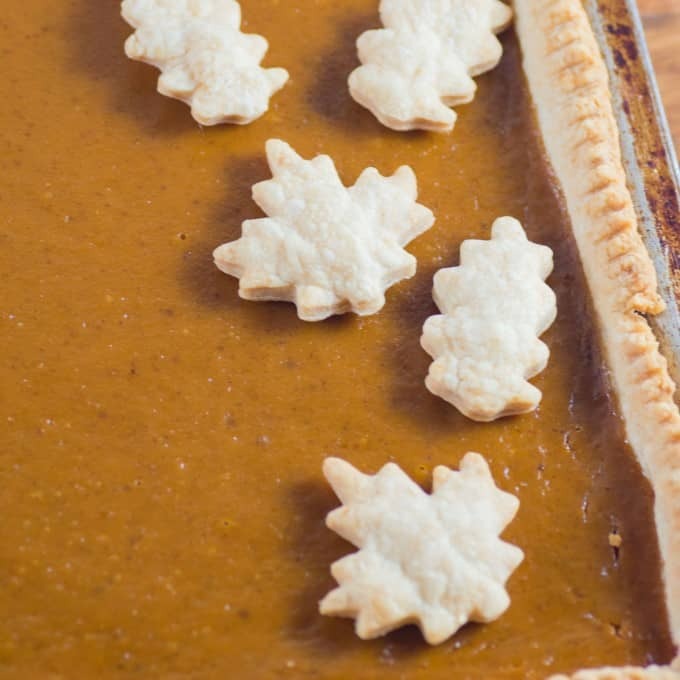 The little leaves can then adorn the pie how ever you like. They make the pie so much more festive! To make a great pumpkin pie I think you need a couple of must ingredients. Besides pumpkin puree (which is not pumpkin pie filling), I like to add in brown sugar and evaporated milk along with lots of eggs. We used 6 eggs for this recipe. 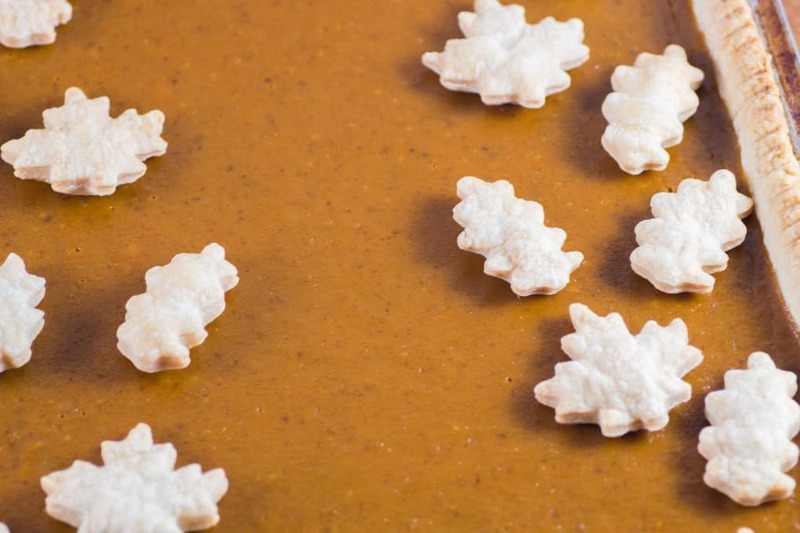 These ingredients will give you a wonderful pumpkin pie recipe. Nice and light with that amazing brown sugar flavor. I wouldn’t say it is double as you don’t want too much pie filling and it overflows up over the crust. The amount that our recipe has is just perfect. It is specially designed for this dessert. Pumpkin pie spice is a blend of spices that you can buy already made for you. It is a combination of spices that are normally used in pumpkin pie recipes. It normally includes cinnamon, nutmeg, ginger and cloves. You can either make your own pumpkin pie spice easily or buy it ready made. We used 4 tsp. of pumpkin pie spice for this recipe. To make up some on your own simply mix 3 tablespoons ground cinnamon, 2 teaspoons ground ginger, 2 teaspoons ground nutmeg, and 1 ½ teaspoons ground cloves. Some recipes also include allspice which you can add in if you like using, about 1 1/2 tsp. This spice will be handy not only for this recipe but many more when you are baking with pumpkin. You need to cool this pie completely before serving. I normally have it in the refrigerator ready, covered in plastic wrap and when I want to serve it take it out about 1/2 hour before so it isn’t ice cold. Have your whipped cream already to go also. My tip for whipping cream quickly though is to have the bowl and whippers ice cold from the freezer. Put your whipping cream in the bowl and it will whip up faster and better than using a room temperature bowl. I like to use super fine sugar also known as berry sugar to sweeten. In a pinch confectioners sugar or icing sugar works too. We are talking simple baking at its finest here. I also have for you our pie dough which makes the best pie crust ever. It is simple to make using your food processor and it has a great balance of butter and lard to make a deliciously flakey pie crust. We took our standard two crust pie dough recipe and doubled it. You may have some leftover but it is way better to have too much than not enough. You also may make some errors in making the leaves so this gives you plenty. If you have pie dough leftover simply wrap it well in plastic and put it in your freezer for another use. We had some leftover to make a delicious Crabapple Strawberry Tart. 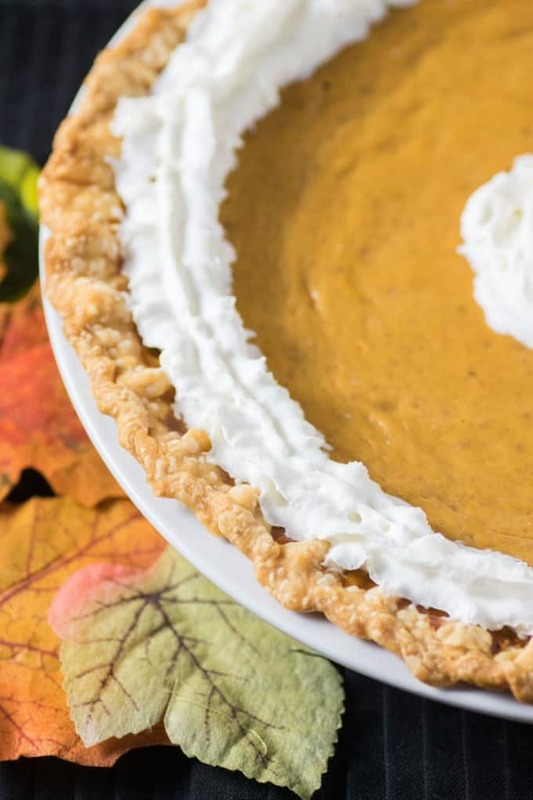 If this pie still seems too daunting for you I do have a Super Easy Pumpkin Pie Recipe using store bought pie crust and canned whipped cream. I get it, sometimes we all need a little break from the holidays too. The crust you get in the refrigerator section so you can still have it in your pretty pie plate. It looks like you slaved away forever but honestly couldn’t be easier. We all loved this very simple pie too. 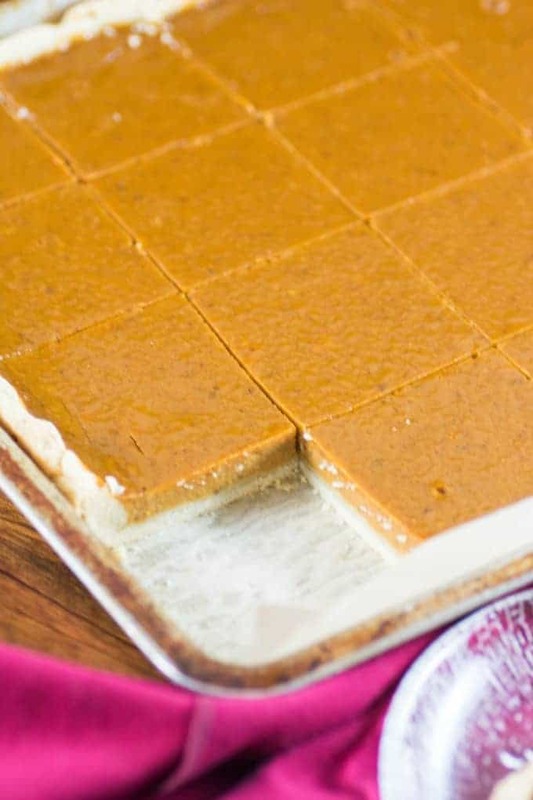 A Pumpkin Slab Pie is the perfect dessert to feed a crowd for the holidays. For the pie dough: Using a food processor and in two batches if your food processor is too small, add the flour, sugar and salt and pulse a few times. Add the butter and lard and continue to pulse until the dough is in pea sized shapes. Don't over mix, maybe 8-12 times. Now with the machine running pour the water down the tube and continue to pulse until it forms a ball adding in more water if necessary up to the 16 Tbsp. mark. Remove dough and place on a floured surface and roll into a ball. Wrap with plastic wrap and refrigerate for 30 min. Preheat oven to 375F. Line a 17x11" jelly roll pan with parchment paper and set aside. For the filling: In a large bowl add all the filling ingredients and blend very well. Set aside. Roll out about 2/3 of dough onto a lightly floured surface. Roll dough out thinly so as the middle of the pie will cook. Fold over in half and place on the jelly roll pan and unfold. Press into the pan and then trim the edges. Fill the pie with the filling and bake for 50-60 minutes or until the filling is set. Allow to cool completely. Refrigerate covered in plastic wrap until ready to serve. Whip cream using an icy cold bowl and whippers. Add in berry sugar to taste. Whip until stiff peaks form. Cover and refrigerate. With some or all of the remainder of the dough roll out and cut out 24 leaves. Once the pie is out, reduce heat to 350F. 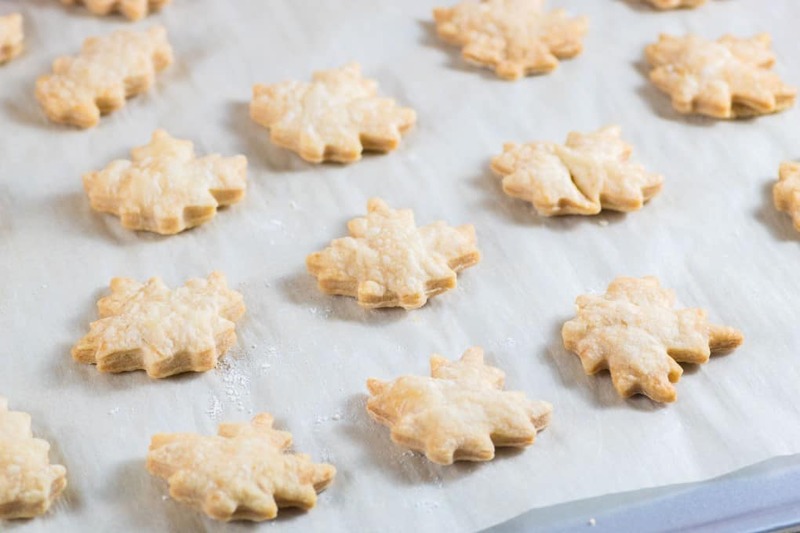 and bake the leaves on parchment or a silpat lined baking sheet for 20 min. or until golden brown. Remove from refrigerator about 30 min. prior to serving. Slice into 24 squares. 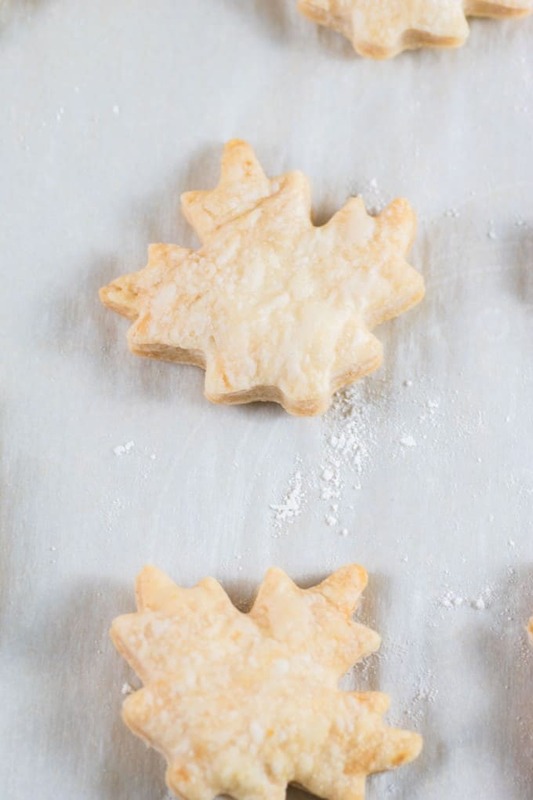 Serve with a dollop of whipped cream and a pie crust leaf. I love this! 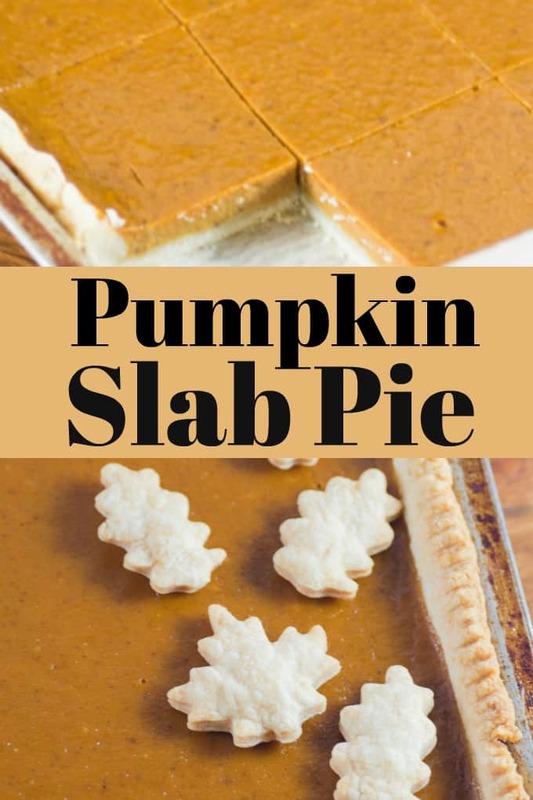 I’m a huge fan of slab pies because I don’t love crust. With a slab pie, I can eat without feeling like a toddler for leaving the crusty edge behind. What an awesome way to feed a BIG family during the holidays! This is brilliant – like a sheet cake of pumpkin pie. I just wanna dive into that! Can I use can pumpkin? and how much would I use? Are you talking fresh pumpkin that is baked and pureed? Then use the same amount as in canned. I do recommend the canned as I have had more success.